Vacuum clamping systems are one of the best investments you will make for your shop. Whether you are routing, veneering, milling or sanding, vacuum systems increase efficiency, as well as allow you to hold "difficult" pieces and accomplish curved veneering easily and quickly. This manual system is operated by a hand valve. 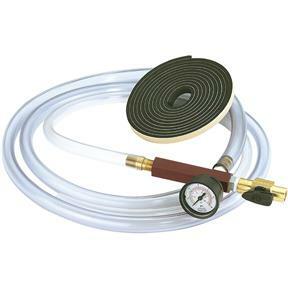 Kit includes VAK pump, 5' hose, 10' neoprene tape, gauge, brass fittings and on/off valve. Recommended compressor size: 2 - 4 H.P.